When you spend $130 on a headset, expectations are going to be high. But given the reviews I’ve read about the effectiveness of the technology in this headset, I’d say I’m going to be even more skeptical than normal. First off, a few things to note. I’m going to write most of this review as I experience everything for the first time, so my impressions and thoughts on what I see, feel, and hear are all first impressions. 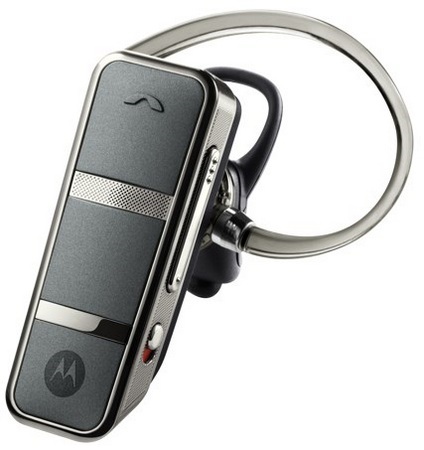 Also, I have to admit I’ve never been a fan of Moto BT headsets. Any of the few models I’ve tried have fallen short of expectations. I’ve never been a huge fan of their ergonomics, and less a fan of their tinny sound quality. The exception has been my Moto Rockr S9 stereo BT headphones, which I think have excellent stereo sound; though I haven’t used them very often for phone calls. Also, as with the other Moto headsets I’ve tried, the ergonomics and form factor of the S9 leave something to be desired. My motivation for wanting this headset is that I have a convertible, and have been waiting for so-called ‘bone-conduction’ technology to make its way to commercially-available BT headsets. 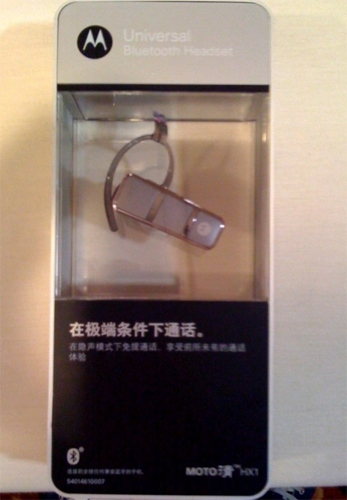 The idea is that an external microphone in a very loud environment is useless, so if there’s a way to take the vibrations from one’s skull that occur during speech and convert them into something that can be understood by another person, an internal mic (in the ear) can be used instead, resulting in no outside noise whatsoever making its way into the mic. The government has been using it for years, and I’ve heard of a number of headsets in the works that never came to market (i.e. the Nextlink Invisio Q7, though from what I understand, Moto bought that technology and uses it in the HX1). Most of us are familiar with the Aliph Jawbone, which uses vibrations from the user’s jaw to activate the mic. The idea here is that when speaking, the close proximity of the user’s mouth to the mic would drown out the background noise, and when the user isn’t speaking the mic is turned off. Many people really like the Jawbone, and it seems to be the best solution to loud background noise out there. I, however, am not a fan of this headset. I bought a Jawbone 2 for my wife and wound up using it for a few weeks. I found that even with the multitude of fitting options available, it never fit quite right (the sensor needs to touch the user’s cheek), and I thought the sound quality was awful (extremely tinny). My current headset is a BlueAnt Z9i, which has the best sound quality of any headset I’ve tried, but isn’t very good in windy conditions. So let’s see what Moto can do with a $130 headset that’s on the cutting edge of technology. The box is a heavy and made of plastic and aluminum (I believe). It’s a slick, yet over-done, presentation. As much as I didn’t like the Jawbone as a headset, I must say that it was beautifully packaged, and came well-appointed with accessories, including many ear hooks and gels, and an interesting magnetic charging cable with AC and USB charging options. I feel like Moto is trying to emulate the coolness of the Jawbone packaging, and to a certain degree they did. That is, until you try to open the box! You actually need a screwdriver to open it. I had to pull off the plastic display hanger to get to a plastic flat-head screw at the top that had to be turned to open the front plastic window. Even after the screw is out, I needed the screwdriver to pry the window off. There are no instructions for getting into this box, so good luck to the non-mechanically-inclined! With the box finally open, I started taking out the contents. The headset itself is attached to the mount on the plastic window with clear rubber bands. I needed a knife to cut them out! Carefully, as to not scratch the headset. With the headset out, I pulled out the accessory box. Opening this box, I was quite disappointed to only find an AC power supply and no USB connector. There are also a few ear cushions in a small plastic bag and a Quick Start Guide (the only guide, actually); nothing nearly as nice as the presentation inside the Jawbone box. Also, there’s only the one ear hook that’s already attached to the headset. VERY weak for $130. Now onto the headset itself. The front of it (that someone would see if it was in your ear) is very nice-looking. Metal and plastic, and quite small. I very much like the sliding on/off switch. Looking at the ear hook (remember there’s just the one), it’s plastic with a metal connector, and it’s clipped onto the headset. It looks very cheap and breakable. It also moves very easily on its hinge, something that I really don’t like about my BlueAnt (one of the few things I don’t like about it!). We’ll see if that comes into play once I put it on. Before I continue, I once again want to reiterate how lame I think it is that for $130 Moto couldn’t include a USB charging cable. It uses microUSB connector, which isn’t very widely used today (though I hear it’ll be more widely-used starting next year). If it used a miniUSB, I’d have a bunch of cables for it lying around, but since it doesn’t, I’ll have to shell out more money for a USB charger cable. As per the user instructions, I’m now plugging it into the WALL to fully charge it before use.